Why hasn't someone thought of this earlier? The Cincinnati Zoo has installed solar cells over about 800 spaces of its 1,000-car parking lot. The cells will generate enough electricity for about 20 percent of the zoo's power needs. And zoo visitors will return to cooler cars at the end of their visit. 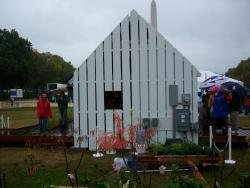 A solar home and a rainy day DC: This is the University of Minnesota's "ICON" solar home. Even beyond MN solidarity, ICON was one of my favorites. It ended up getting the top scores in the engineering and lighting competition, and 5th place over all.Courtesy JGordonAhoy, Buzzketeers. Sorry, it’s been a few days since I’ve posted, but, see, I’ve been traveling… to the future. By the way, I consider the east coast to be the future, because, you know, whatever time it is here… it’s an hour later there! I often call my friends in New York just to ask what I should expect in the next hour. “Loneliness,” they say. But this weekend I too got to see the future with my own eyes. 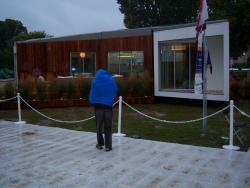 And I will tell you this: the weather is awful, but the houses are pretty sweet. 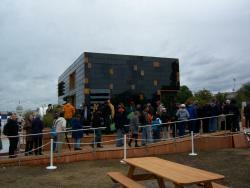 I attended the final two days of the Department of Energy’s Solar Decathlon in Washington DC. Art did a post on the Decathlon last week, but here’s a quick refresher: the Solar Decathlon is an architecture, design and engineering challenge, sponsored by the US Department of Energy, in which colleges and universities from around the world (mostly from the United States) compete to build the best solar-powered home. The houses are judged in ten categories: architecture, engineering, market viability, lighting design, communications, comfort zone (temperature and humidity), hot water, appliances, home entertainment and net metering. The intention is to build a home excelling in those categories that gets all its energy (and more, sometimes) from the sun. The houses in this competition were all approximately 800 square feet, and designed accommodate one couple each. Obtaining and using solar energy (through both photovoltaics, for turning light into electricity, and solar thermal, for gathering heat from solar radiation) is, of course, a major focus in the houses, but there was a lot more to the houses’ innovations than the arrays of solar panels. Everything is engineered to use as little electricity as possible, so windows are placed to get the maximum amount of light during the day, hot water is used to heat the house and (in the case of Minnesota’s house) dehumidify the air (see the picture and caption), and everything was carefully insulated according to the environment the house was designed for. In Arizona’s house, for instance, the windows on the southern wall were filled with water, which would absorb heat during the day, and radiate it back off during the cool night, while the University of Illinois at Urbana-Champaign insulated their home so thoroughly that they claim it could be heated with a handheld hair dryer. Many of the houses used energy so efficiently that they would—over the course of a full year—produce more energy than they used, and could feed the surplus electricity back into the grid, essentially selling it to the power company. I was able to get into 19 of the 20 houses (the line to the house that took first place, Germany’s, was just too long), and they were all quite nice. None of them had the feeling that I think is sometimes associated with “green” products—that is, that they won’t do whatever they’re supposed to do as well as the products we’re used to. The things that seemed “off” to me were design decisions that weren’t necessarily associated with energy use (I’m just not into wet bathrooms, I wouldn’t want an exterior door opening into my bedroom—that sort of thing). The problem I had with most of the houses was, ironically, that they were too nice. In ensuring that the houses would be both very energy efficient and very comfortable, almost all of the teams ended up with pretty expensive projects, even though the contest limited the houses to a footprint of about 800 square feet. This site lists estimates of construction costs of the homes, and as steep as they are, I’m not sure they’re totally accurate—maybe it was just gossip, but some of the architects were saying that a couple teams’ projects ran up to and over a million dollars, which doesn’t seem to be reflected on the Solar Decathlon’s official page. Only Rice University’s house, built for a lower income couple, was less than $200,000 dollars. Most of the homes cost several times that. I understand that these are prototype structures, and that their costs would be significantly reduced if they were mass produced, but even dropping $100,000 off a $600,000, 800 square foot house still leaves you with an awfully expensive house that most people (including the designers) would consider too small for an average family. The homes were built with particular markets in mind, and those markets were generally young, professional couples (with money) or retiring couples (with money), but if the point of the competition was to make progress in sustainable design… well, that doesn’t make much sense. Sustainable solar architecture has to be something that most of the people in the world could afford to take advantage of. Even if everybody in the world who could afford to buy a very small, half a million dollar solar powered house did, I don’t think it would make much difference to the planet’s consumption of non-renewable resources. It would be interesting to see family-sized solar homes built, or systems that could power an apartment complex… something like that. I’m sure the architects and engineers involved would be totally capable of that, but it wasn’t the nature of this competition. It was still all very cool, and it’s neat to see what people come up with when they aren’t really bound by the above practicalities. Maybe seeing new, innovative features in beautiful little luxury homes will get people excited about using them on a larger scale, or implementing them into their older houses. I’ll toss some pictures of the event up with this post, but then I need to get back to trying to adjust back to the present time. I mean, for most of y’all, it’s like 3:00. But for me it’s like 4:00. I’ve got to get out and buy some lottery tickets before this wears off. Suntech Power Holdings Co. Ltd., the world's largest solar module maker, suspended its plan to expand capacity by 40 percent in 2009. Instead, it laid off 10 percent of its 8,000 strong workforce. My hope is that a change in government incentives will prove to be a game changer. First Solar was featured by Investopedia yesterday as a solar company to watch in 2009. Tags : anthropocene, Earth Buzz, economics, Future Earth, power, solar, solar panels, solar-panels, Suntech, Suntech Power Holdings Co. Ltd. It seems that everywhere I look, energy is in the news these days. Here are a few more stories that caught my eye recently. Delaware is considering building a massive windfarm in the waters off their Atlantic coast. Experts estimate this could generate enough energy to light 130,000 homes. But some people raise concerns about the damage this might do to migratory birds, ocean shipping, and the natural beauty of the view. We’ve discussed how nanotechnology might revolutionize solar energy elsewhere on this blog. Now come word from Rice University of a breakthrough: an efficient means of creating molecular-sized semiconductors, an important component of high-efficiency solar panels. Ethanol. Biodiesel. Hydrogen. Lots of new fuels are vying to replace gasoline as the automotive energy of the future. Popular Science magazine gives a run-down on the pros and cons of each. We’ve had a couple of threads here on Compact Fluorescent Bulbs and the advantages of replacing your regular bulbs with low-energy CFLs. For those who want to learn more, here’s a handy round-up, telling you everything you need to know about these bulbs. Solar panels: boon or boondoggle? Some people are installing solar panels on their homes. These panels generate electricity from sunlight. Using the panels will lower your electric bill, and reduce demand from power plants (which often burn coal). On April 15, the San Francisco Chronicle said yes. They looked at the costs of buying and installing the panels, and weighed it against the benefits (which include getting a tax rebate). They found that, over 25 to 30 years, the average home would save about $33,000. So, solar panels are a good idea, right? Not so fast! On April 14, the NY Times reported that solar panels never pay for themselves. Even accounting for electrical savings and tax rebates, they are so expensive that you never make your money back. Different tax rebates in the two states. More sunshine in California, making the panels more useful. The panels are almost twice as expensive in NY than in SF. The NY Times assumed that, if you didn’t spend the money on panels, you’d put it in the bank or otherwise invest it, where it can earn money for you. The SF Chronicle did not take this into account. So, whether or not solar panels are a good financial investment depends on a lot of factors. 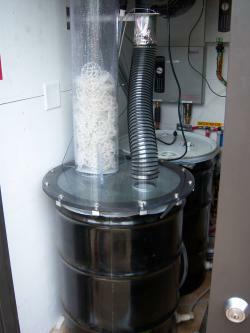 Whether they are good for the environment is much easier to answer – they produce electricity without pollution. In the future, the debate may be moot – scientists are working on new types of solar cells that use nanotechnology, which may bring the costs way down. Almost every September my wife and I stay with some friends in California. Because their house has solar electricity and hot water we are told to not feel guilty about long, hot showers. Their electricity usage is also pollution free. Californians are leading the way by supporting renewable energy. This week they passed a bill, signed by Gov. Arnold Schwarzenegger on Monday, that calls for the installation of one million rooftop solar panels on homes, businesses, farms, schools and public buildings by 2018.